We have a small but growing population of urban fairies in Ann Arbor, Michigan. You can find where they live by searching for the neatly decorated fairy doors that tastefully integrate with the architecture of the human buildings that they share space with. Most of the fairy doors in Ann Arbor are near shops and other businesses in the downtown area, but they've also been seen in school classrooms (they love children! ), bookstores, in the public library, as well as a few homes. Learn more about these delightful creatures, and see a few of the fairy doors that grace the buildings in Ann Arbor. The city that I live in, Ann Arbor, Michigan, is home to a small but growing population of urban fairies. These fairies, like their woodland counterparts, are understandably shy and elusive around humans -- we're big and loud and clumsy in their eyes -- but they feel safe living in this fairy-friendly town. Their neatly built and decorated fairy doors are easier to spot than they are themselves, although some people, especially smaller children, have seen a few of them behind their doors! Did you even know that there are such beings as urban fairies? I would guess that most people still think all fairies live in the woods, under large mushrooms or in tree hollows. That's really a rather uninformed, romanticized concept of fairies in this day and age, don't you think? Fairies, just like human people, live in many different kinds of settings. Just as many humans love to live in the city because of its conveniences, so do many fairies. The urban fairies like being around people (even though they are shy, and don't show themselves often), so it makes sense that they share some of our living spaces and work places, including shops, libraries, and schools. The fairy door shown below is one of the best known in Ann Arbor because it's on a busy corner in the downtown area. It's the first one I discovered, and I enjoy going back to see what little gifts have been left on the door step for the fairies that dwell within. The first reported evidence of urban fairies living in Ann Arbor was in graphic artist Jonathan B. Wright's home in 1993. After he did some renovations in their old 100+ year old house on Ann Arbor's Old West Side, his daughters discovered a small 6" high door, that when opened revealed a small staircase and railing going up to another door (that is always locked, so they don't know what is behind that door!). They found more fairy doors after a couple of other renovations as well. Obviously the fairies had found a place they loved in this well-cared for house! 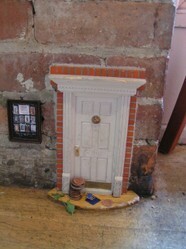 In 2005, Jonathon B. Wright was surprised to hear that another fairy door had mysteriously appeared in a local downtown business, Sweetwaters Cafe (shown in image at right -- note the pennies for scale). Soon after, more fairy doors appeared at different establishments in the downtown area, and other nearby locations. Wright was so intrigued by these new appearances that he decided to study of the phenomenon of urban fairies and their fairy doors, thus becoming Ann Arbor's first (and only?) fairyologist. He keeps up with where the new fairy doors appear (and when some, sadly, disappear or are damaged). He also leaves journal guest books at the locations of fairy doors in public places so people can write their impressions of the fairy doors, ask questions, and draw pictures of any fairies they may have seen. Most of these sightings are by children, since they have better eyes to see the fairies -- and the fairies don't seem to be quite as scared of children as they are of us grown-ups. He's been amazed at the little gifts that are left for the fairies by their doors, such as pennies, small pieces of candy, buttons, drawings, and other small trinkets. We all want to make the fairies feel welcome in our city, so of course we're going to leave them little goodies from time-to-time! But then a new surprise revealed that these gifts were collected from time-to-time and neatly stacked in the fairy shop connected to The Peaceable Kingdom shop in Ann Arbor. Visit Peaceable Kingdom Fairy Annex and scroll down the page for pictures of the fairy store. Some of the wonderful and unusual items on the shelves are coins, baby teeth (! ), feathers, origami crane, a crayfish claw, a ring, a carved frog, some pigs, and many more. Read more about Ann Arbor's urban fairies at urban fairies operations (u.f.o. ), a website maintained by fairyologist Jonathan B. Wright. Wright also has a revised edition of his book, Who's Behind the Fairy Doors? out now. This book includes comments, illustrations, and questions (with his answers) that were left in the guest books at many fairy door locations. You can find a few of the original editions of the book on Amazon (see below), and copies of the new edition at Ann Arbor's Nicola's Books. Who's Behind the Fairy Doors ? Our urban fairies have a strong sense of harmony and beauty (as all fairies do), and they build their doors, rooms, and shops to integrate with the architecture of the human buildings that they move into. You can see that from the photos on this page. They choose door styles and colors that go well with the rest of the building as shown above on the beautifully finished fairy door at Red Shoes (gifts and home goods store). Red Shoes, by the way, sells some pre-made fairy doors if you'd like to invite some fairies into your home! Visit the Google Fairy Door page on Urban Fairies. Fairies have also taken up residence in Nicola's Books. Their door, which is near a cozy fireplace in the bookstore, is flanked by two books, "Anderson's Fairy Tales" and "Cinderella and other Classic Italian Fairy Tales". 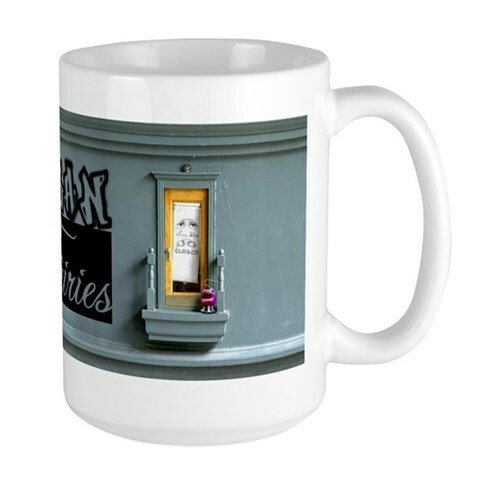 You can see pictures of other fairy door locations at urban fairy operations - locations. This is great! Well told! Ahhh, Traverse City is a great place to be! We go there periodically for vacation. I think it would be a natural step for some of our urban fairies to travel north and add a few doors in your area, brl! These fairy doors have really fascinated young kids, especially girls (although some boys too!) in our area. Yes, I'm sure they bring good luck and fortune :-) Thanks for your comment, katie! Oh wow! They are so cool! I want to go to Ann Arbor and see them!